The art museum is a social phenomenon that owes its origins to the Age of Enlightenment and its extension to all people to the French Revolution. The Museumsinsel is the most outstanding example of this concept given material form and a symbolic central urban setting, and one that illustrates the evolution of modern museum design over more than a century. The present importance of the Museumsinsel began when the Altes Museum was built to the designs of Karl Friedrich Schinkel in 1824-28. A plan to develop the part of the island behind this museum was drawn up in 1841 by the court architect, Friedrich August Stuler, on the orders of Friedrich Wilhelm IV. The first element of this plan to be built was the Neues Museum (1843-47). The next step did not take place until 1866, when the Nationalgalerie, the work of Johann Heinrich Strack, was built. Another two decades passed before the Kaiser-Friedrich-Museum (now the Bodemuseum) was built in 1897-1904 to the designs of Ernst von Ihne, and Stüler's plan was completed in 1909-30 with the construction of Alfred Messel's Pergamonmuseum. 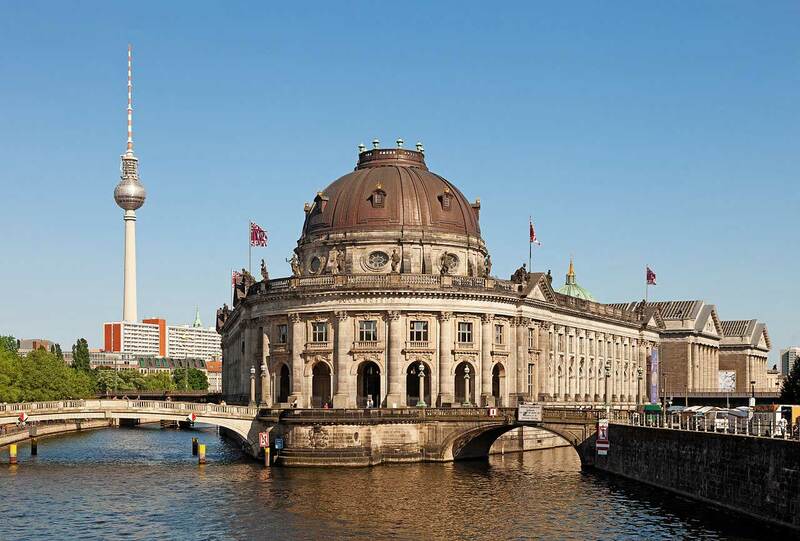 The Altes Museum is a two-storey structure with a rectangular ground plan on a high base with its exhibition rooms ranged round two inner courts and a central two-storey domed rotunda with skylight. The side and rear elevations are relatively plain, but that facing the site of the former Schloss is a high portico supported on eighteen sandstone Ionic columns and two corner pilasters. Access is by means of a seven-bay wide stairway with broad stringers. The layout of the Neues Museum is comparable with that of the Altes Museum, but the rotunda of the latter is replaced by the monumental main staircase. Unlike the Altes Museum, to which it was originally linked by a passageway, it is a relatively plain structure, more in the style of the Schinkel School. The richly decorated interior contrasts with the plain exterior. There is an interesting innovative structural feature. The traditional low-vaulted ceilings of timber beams and masonry are replaced on the third floor by an arch-chord construction using cast-iron arches and pairs of wrought-iron chords. This lightweight form of construction was necessitated by the poor foundation parameters. The Nationalgalerie, a high ashlar block-like base with rectangular windows, is surmounted by a Corinthian pseudo-dipteral temple of in antis type with an open portico. There are also high rectangular windows in the exterior wall set back behind the columns. The rear is in the form of a semi-circular conch. A double-winged open staircase with five flights of steps leads up to the pedimented portico with its Corinthian columns. The building is clad throughout with Nebra sandstone. The four-storey building has a rectangular ground plan with apse-like terminal features. There is a cellar and an exhibition floor in the basement section and two exhibition halls in the superstructure. It is lavishly decorated with symbolic imagery in the form of sculptures, reliefs, and paintings. The upper exhibition floor was originally laid out as a vast banqueting hall, but is now converted for displays. 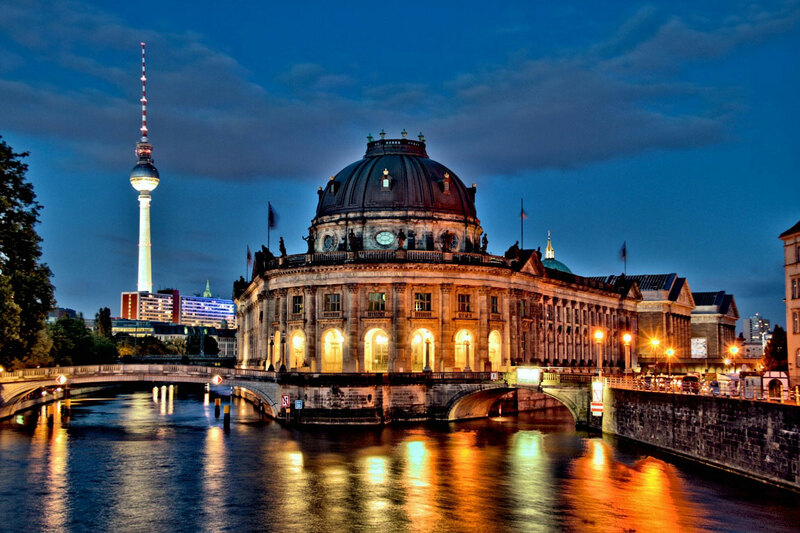 The Bodemuseum is a neo-Baroque structure in a commanding position on the north-western tip of the island. Clad in sandstone and with a low stone base, it rises to two storeys, linked by Corinthian pilasters and crowned with a balustrade. The rounded entrance frontage is decorated with the same columns and with rounded open arches. The entrance with its impressive staircase is beneath the smaller of the two domes. It gives on to two lateral wings and a centre section which are linked by transverse sections so as to form five inner courtyards. The three-winged Pergamonmuseum was built to exhibit the greatly expanded collections of antiquities resulting from German excavations at Pergamon and other Greek sites in Asia Minor as well as those from Mesopotamia formerly housed in the Vorderasiatisches Museum. 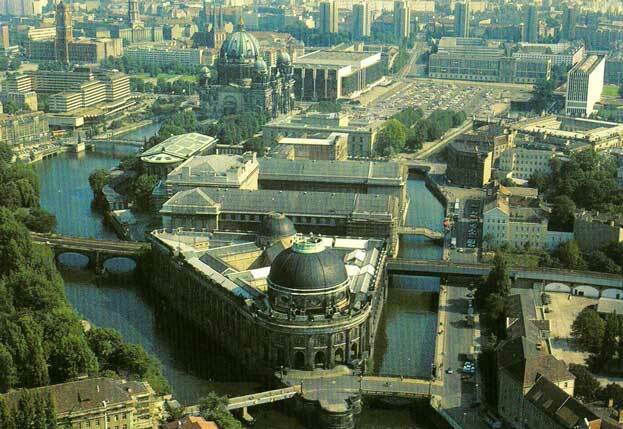 It rises directly from the Spree, like the Bodemuseum, with which it is harmonized in scale and proportions. The centre block and the side wings are windowless, given structure by flat giant pilasters and steep pediments. 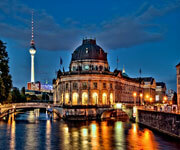 Browse All UNESCO World Heritage Sites in Germany. The original UNESCO inscription Here!! !